In our opinion "One man's trash is another man's treasure" should be the slogan for every thrift store in the world. Thrift stores are magical places where you can be thrown back a couple of decades back and find something that you've wanted for a very long time. 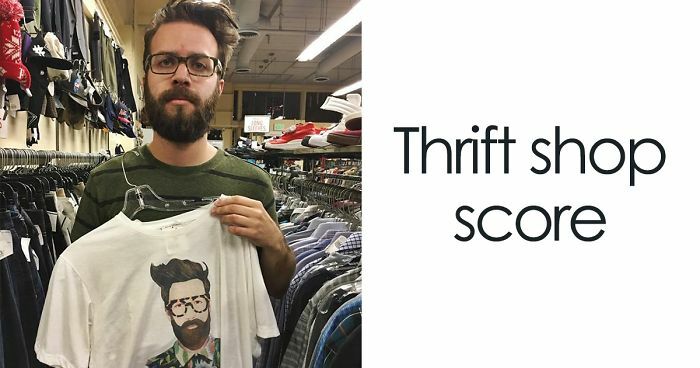 If your hunt succeeds, your goodwill finds will be something you can definitely brag about. Some people think thrift stores, yard sales, and flea markets are nothing but places to find piles of junk that other people don't want. Others see them as veritable treasure troves full of goodies just waiting to be discovered. And, as you can see from this list of best thrift store finds compiled by Bored Panda, it seems like both of those camps are correct. While some lucky folks have managed to add signed copies of Hemingway novels and Arnold Palmer's old trunk to their collection of thrift store finds other people have parted with their well-earned cash for...well...just see for yourself. Our picks of best goodwill finds are sure to make you at least a tiny bit jealous, so go out there and find your own pot o' gold! It's absolutely stunning and you were destined to wear this.... Congratulations!!! Your hair's the wrong way dude! It has legs too! Spooky. Omg I want this so bad. You should make a mould and start mass-producing these! Classic. This or a hidden alcohol tank. Lucky you! It is not only valuable, it is beautiful too! #19 $12.99 For A Nikon D3200 And $9.99 For A Cannon Eos Rebel Xs. Both Basically Brand New. Thanks Goodwill! Jesus!! Bargain of the century!! Bet someone spent a long time looking for that at some point! #29 Should I Write Him On Twitter And See If He Wants It Back? Yes, do it and let pandas know the result! Original Lego? That's at least 200$ there. From Juno's hands to yours. I was expecting another picture of the box opened and fishing lures and a heart inside. Very disappointed. I need that as a real Potterhead! Should have worn this at his early release arraignment. OMG I wish I could upvote this a million times. Who cares about the captain? Look at my future husband on the left side! EVERYONE should read this book. Or just the title, and follow it! It's beautiful. How much was it? So quickly did an "inflation calculator" to see what this ticket would cost today. $53.72! WTF? I practically pay that in service fees when buying tickets. College costs have gone up by 156% ... Concert prices have skyrocketed by at least 2534%! Its looks so clean and pretty! I like the cats interspersed with the cameras. That's a good eye for display. Ancient Greek statues were actually colourful. Paint it and cardiologists will be the newest trend. oh, you know this was some mother trying to get rid of her grown kid's stuff... and he's gonna be pissed. I am jalous! Really good knifes are pure gold. I'm guessing you took apart the picture frame and have spent the $6? I think everyone in the country must have far better Goodwills than in the city closest to me. They carry NOTHING but junk and the place is awful to even go to. Dude! GREAT shade!!! Make more and sell em on etsy.com. And the wearer looks appropriately thrilled! Brennan approves. Goes great with a movie-quality chewbacca mask. It's japanese. There's a long tradition of painting anthropomorphic cats. I don't see that as tacky. My grandfather actually grew up and was best friends with Arnold Palmer. Both were taught golf by Arnie's dad, Deacon Palmer. He was in my Grandad's wedding, and he said my grandad could have gone pro if it wasn't for health which kept him bedridden the last 3 years of his life. I always think about how my life would have been different if he wasn't sick. I probably would have taken up golf myself, but I never did. Rudolph Melichar will be the legend that could have been. Oh man I need one of these so I can make authentic stroopwafels.